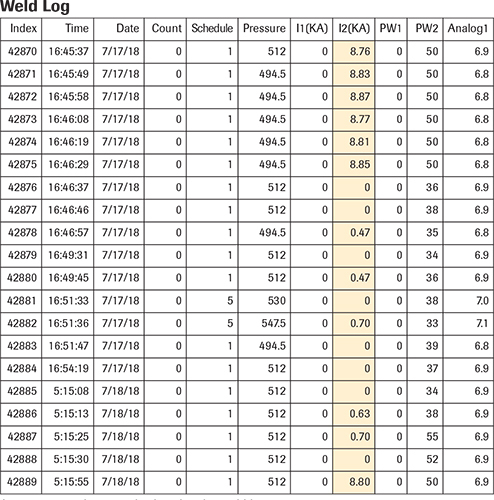 Low current values are displayed in the weld log. In today’s pressure-packed just-in-time manufacturing environment, proper troubleshooting procedures for resistance-welding problems often are ignored in favor of low-cost attempts at quick fixes. 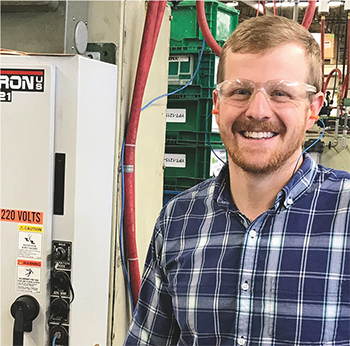 Miles Sonnenberg of HTT, Inc., Sheboygan, WI, is a great example of a manufacturing engineer who made the leap from guessing at solutions to resistance-welding-quality issues to quantifying and solving them properly. Founded in 1986 as High Tech Tool & Die, HTT specializes in deep-drawn stampings. As a value-added secondary operation, the company attaches brackets to round parts, each with a single spot weld. Since it’s an automotive application, that lone weld must be strong. However, HTT had significant weld-quality issues related to nugget size and strength, and adding to the challenges, these weld-quality issues varied between shifts. As a result, HTT’s customer required a time-consuming, 100-percent quality check of the parts supplied, hurting production and profit margins. Absence of a way to monitor key weld quality variables, such as current and force. After purchasing new tooling, Sonnenberg performed an electrode-tip-life study to address when the tips needed to be dressed or changed. This improved weld quality, but not enough to satisfy the customer, which continued to demand 100-percent quality checks. Current monitoring. Generates a fault if the welding current falls outside of preset limits. Constant current. Automatically compensates for welding-current losses due to changes in the incoming line voltage or secondary circuit impedance. Differential pressure transducer. Monitors pressure at both ports of the air cylinder and does not allow the machine to fire until the proper weld pressure is reached. Electronic pressure control. Allows the weld force to be set from the weld control, thereby eliminating the manual regulator that operators could previously access. Weld log (see Weld Log table). Creates a date and time stamp for every weld sequence, including key parameters such as weld time, weld current and pressure/weld force. Error log. Generates a date and time stamp each time that a fault is generated. In addition to purchasing the new, state-of-the-art welder control, HTT also invested in onsite installation and training by a certified resistance-welding technician who set up the initial weld schedules. Graph shows the results of a process study using a consistent weld pressure and various weld currents to find the optimum current setting. At this point, Sonnenberg and his associates at HTT put in the extra effort to ensure long-term resistance-welding success. He educated himself on the resistance-welding process and learned how to use all aspects of the control. 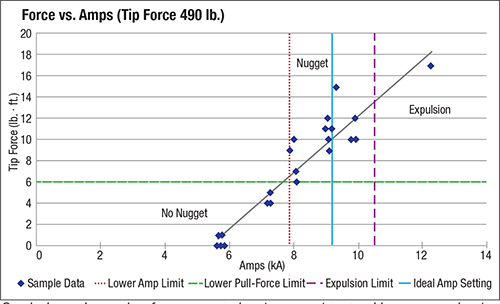 Also, he performed a process study using a consistent weld pressure and various weld currents to find the optimum current setting (see Force vs. Amps graph). In addition, machine operators no longer were allowed to adjust weld-schedule parameters. To compensate for tip wear, they could only select preset proven weld schedules. After installing the new control and performing the process study, HTT finally started to obtain consistent results, enabling Sonnenberg to review data from the weld log for any variations in the process that might cause quality issues. As a result, HTT was authorized to stop the 100-percent quality check previously required by its customer, which saved around $30,000/yr. In addition, the company now uses around $2000 less per year in consumables (copper electrodes). These combined savings paid for the new control, installation and training in just a few months. Miles Sonnenberg of HTT, Inc. took the guesswork out of arriving at solutions to resistance-welding quality issues. After several months of consistent results, HTT once again experienced quality issues. An outside expert suggested that if the weld current and pressure value were consistent, as was proven by the new control, the problem likely was an electrode or part fitup issue. Sonnenberg confirmed that operators were changing tips at the proper intervals. Then he looked at the parts and noticed that some were out of round. An internal discussion revealed that operators routinely turned up the weld force when they saw such parts. Recognizing that using the welder as a forming machine to overcome part springback was a bad idea, Sonnenberg had new parts made, and spot-weld quality immediately returned to normal. A third-shift operator reported another potential issue, a popping noise coming from the weld area, accompanied by a low-current error on the control. However, by the time the first shift arrived, everything was back to normal. HTT’s outside expert suggested that another part or fitup issue was at the root of the problem, and that if it happened again, production should be stopped until Sonnenberg could come to the machine. When the same scenario occurred several weeks later, Sonnenberg found oil absorbent on some of the parts, which he suspected had been picked up from the bottom of the parts container. Through a controlled experiment with oil absorbent applied to the part manually, he was able to recreate the condition. Miles Sonnenberg, manufacturing engineer, HTT, Inc.
Paul Bush, certified resistance welding technician, T. J. Snow.